Thassos has the most fertile soil of all the Aegean islands. Thassos was and is known as "the green island". 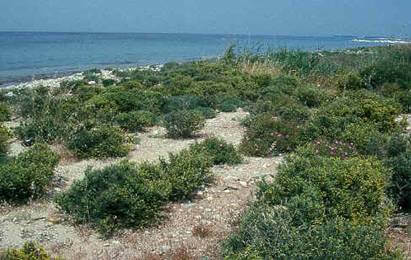 The scrub vegetation here is unique, with its fragrant arbutus, myrthe, rosemary, oregano, sage and thyme. The surface of the island is is covered by dense forests of pines, oaks, firs and plane trees, all trees whose timber has been used since ancient times for various purposes, including shipbuilding. Moreover, near the rivers and lakes you will find a type of vegetation called Macchia. The major forest fires in the 1980s that destroyed a large part of the pine forests caused the disappearance of wild animals such as wolves and jackals. Today on the islad can only be found foxes, hares, weasels and other smaller mammals. The majority of sheep and goats on the island are wild (goats and sheep wander around freely in many regions, especially in montainous areas). 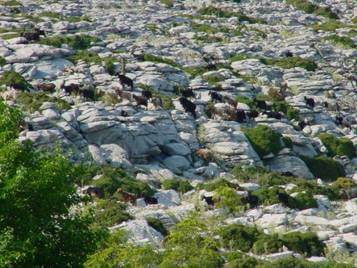 The Thassos goats in particular are known for their delicious meat which can even be found in Athens . Sometimes you can also see snakes on Thassos. But the most of them are non-toxic. Only one kind of snake is known as toxic - it is the sand-viper. The bite of a sand-viper can be dangerous to life. 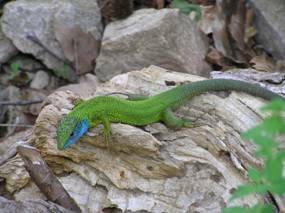 The Green Lizards Lacerta Viridis ( with a blue throat) are widespread throughout the island. Other reptiles and amphibians can be found, especially in early summer.